File-building involves much more that compiling the necessary documents and writing a statement. Come learn about what makes a reappointment & promotion file stand out as well-crafted, engaging, and user-friendly. This session features recent CCFRAP committee members discussing their insights about how to create a robust and well-organized reappointment/promotion file. This session will be relevant for all faculty – from new faculty who are eager to know more about the process to senior faculty who are preparing for a promotion to full professor! This informational session focuses on the timeline and process for those individuals who will be standing for reappointment and/or promotion in Fall of 2016. While any who are interested may attend, this session will specifically benefit those who would like to consider their preparation and timeline for the upcoming academic year. 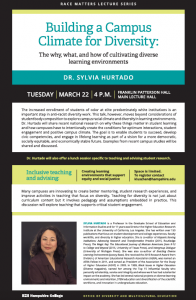 Sylvia Hurtado to speak on inclusive teaching & advising on Tuesday, March 22nd. Dr. Sylvia Hurtad o, one of the foremost researchers in higher education on diversity and student learning (particularly with regard to STEM), will be visiting Hampshire this Tuesday to give the Race Matters Lecture at 4pm. The lecture will address campus-wide conditions that support student learning, critical dialogue, perspective-taking, campus participation and belonging. In addition, Professor Hurtado agreed to give a lunch talk (noon-1:30pm) specifically focused on classroom teaching and advising. 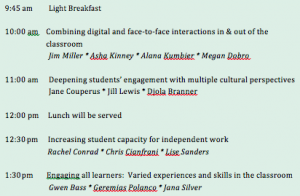 I encourage you to take this opportunity to learn about specific strategies and classroom conditions that would support critical and engaged dialogue. FRIDAY, NOVEMBER 13th, 10:30am – 12:30 pm in the Faculty Staff Lounge in FPH. If you have ever written a letter of recommendation when you wanted to say no, have struggled with “telling the truth” even when it would deflate a student’s goals, or have bristled at your own course evaluations, this session will have something for you. Critical feedback is difficult to provide and receive. Join us for lunch to talk about why that is and strategies to improve the experience. Becky Packard, Professor of Psychology & Education, is responsible for Teaching and Learning Initiatives at Mount Holyoke College and is the Director of the Weissman Center. Her research focuses on mentoring, with an emphasis on the experiences of first-generation college students, women, nontraditional-aged students, and persons of color in higher education. 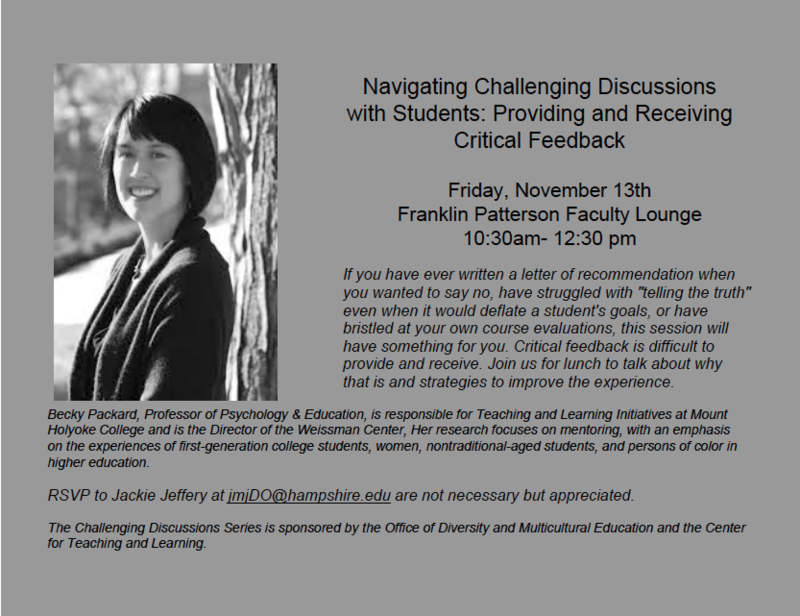 RSVP to Jackie Jeffery at jmjDO@hampshire.edu are not necessary but appreciated. 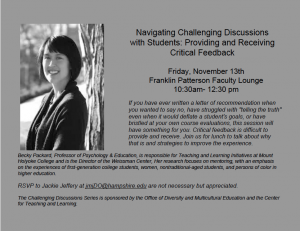 The Challenging Discussions Series is sponsored by the Office of Diversity and Multicultural Education and the Center for Teaching and Learning. 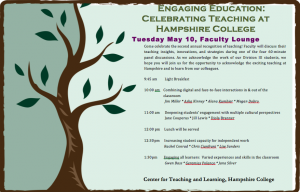 Building on the significant interest in this topic at May’s Celebration of Teaching, this workshop will engage faculty in sharing and developing strategies for inclusive teaching that involve inviting and facilitating discussion across different perspectives and experiences. This workshop will be led by Becky Wai-Ling Packard, professor of psychology and education and the Director of the Weissman Center for Leadership at Mt. 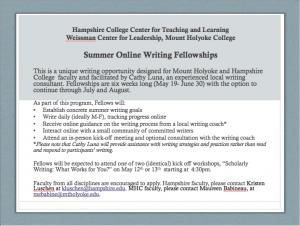 Holyoke College. 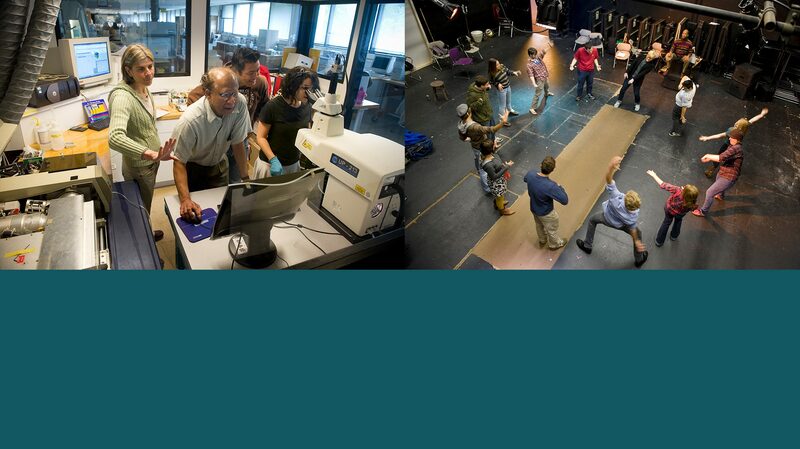 At the Weissman Center, Dr. Packard is responsible for Teaching and Learning Initiatives and new faculty mentoring. Packard’s research focuses on mentoring, with an emphasis on the experiences of first-generation college students, women, nontraditional-aged students, and persons of color in higher education. While educational inequity is a structural issue that requires institutional and policy changes, there are micro-level interventions that can support students’ success and achievement involving visioning and personal reflection. If you get a chance, take a look at this 2015 study by Schippers et al. The authors argue for the significance of structured goal setting and reflective writing on student academic performance and retention. The authors note that, “overall, the results indicate that a comprehensive goal-setting intervention implemented early in students’ academic careers can significantly and substantially reduce gender and ethnic minority inequalities in achievement.” While you might find the intervention in the study to be too involved, it’s worth considering how we involve students in academic goal setting and detailed planning very early on in their college experience. Please share your strategies! Congratulations to Deb Gorlin, winner of the 2014 May Sarton New Hampshire Poetry Prize for her poetry collection, Life of the Garment. Hampshire College professor Deborah Gorlin received the 2014 May Sarton New Hampshire Poetry Prize for her poetry collection, Life of the Garment. The award honors the poet, novelist, and essayist May Sarton (1912-1995) who has long been an inspiration to Gorlin. As winner of the prize, Gorlin’s book has been published by the independent press Bauhan Publishing. Her first book, Bodily Course, won the White Pine Press Poetry Prize in 1997. The second part of the book is from the point of view of dolls from around the world. Gorlin became interested in this particular perspective when she realized how dolls can be perceived as a type of medium—not just as inanimate objects, but as “a bridge between the visible and the invisible.” These poems allowed her to explore outside of her own experience and to imagine the lives of people living in different places, cultures, and time periods. The final section of the book addresses Gorlin’s spiritual struggles. “It’s about the perpetual work required to summon and to engage those divine energies and mysteries in the everyday world and within myself,” she says. 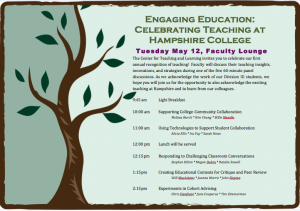 The Center for Teaching and Learning invites you to celebrate our first annual recognition of teaching! Faculty will discuss their teaching insights, innovations, and strategies during one of the five 60-­‐minute panel discussions. 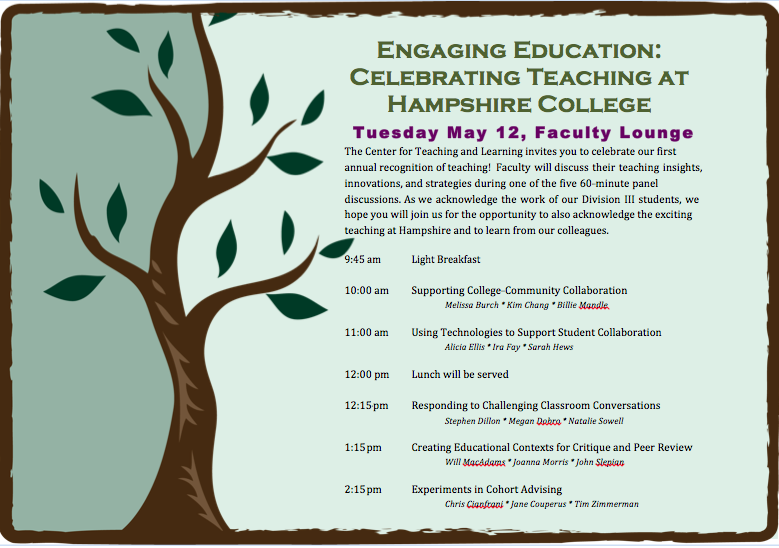 As we acknowledge the work of our Division III students, we hope you will join us for the opportunity to also acknowledge the exciting teaching at Hampshire and to learn from our colleagues.